Thank you, for the opportunity to be a part of your next home project. We at Falco, appreciate and understand the importance that all our clients put into their homes. Kitchen countertop, Bathroom vanities, Tub surrounds, Fireplace, Outdoor kitchen, and all other stone fabrications. Remodeling, Updating or Investing are some of the many reasons our existing customers recommend us to their friends and family. We have the experience, know how and total attention to detail that You deserve. “We wouldn’t have it any other way”. Before You make a final decision. We at Falco Tile Llc, would like you to contact us so you can get an educated assessment of your next home project. Whether you are planning to have ceramic, marble, porcelain or granite tile installed in your bathroom, kitchen, walls, floors, back splash, etc. We are one hundred percent confident that our experience and most importantly our one of a kind craftsmanship, you are not only going to be very satisfied but you will recommend us to all your friends. We recently renovated our kitchen. We knew we wanted granite counters, however, didn't know any reputable contractors. Our kitchen contractor strongly recommended Richie, so, we met at one of the local granite yards. Immediately, we could tell that he really knew everything about granite. He was very patient and beyond helpful, recommending color schemes based on our cabinets and floor. My wife had her heart set on a particular granite, and, Richie talked her out of it - saying it would not match with our cabinets. At first, she was a little scared, but, we trusted his expertise, and, he was right. The stone we selected matches perfectly with the rest of the kitchen, and, we couldn't be happier. The install went smoothly, everything was installed on schedule, and, the price was what we agreed on (no hidden fees or extras). The fit and finish on the granite is absolutely perfect, the edges are all as smooth as glass. We can't say enough about the job that Richie did for us. He is a true craftsman and I would recommend him to anyone needing granite. Do yourself a favor - take the time to meet with him, you won't be disappointed. 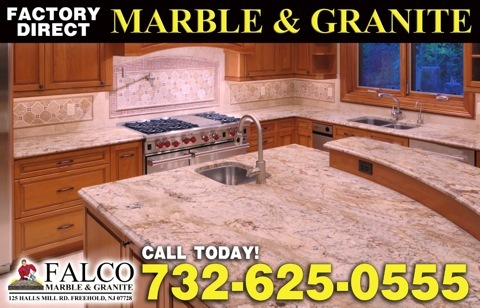 "COMPLETE SATISFACTION IS THE ONLY WAY TO DESCRIBE FALCO GRANITE AND MARBLE. magazines. We have had so many compliments. Serving Monmouth, Middlesex and Ocean Counties in New Jersey.